Disability protesters are back on the street today to continue their campaign, but this time in front of Dáil Eireann on Kildare Street, where they will hold a press conference at 2 pm today. 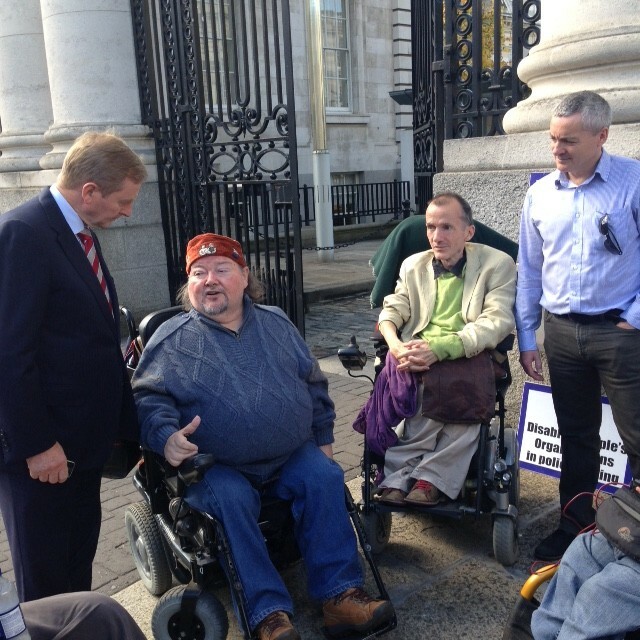 Martin Naughton, one of the campaign leaders and Director of Áiseanna Tacaíochta (ÁT), thanked An Taoiseach and the Minister for taking the time to meet with them, but said that there was frustration amongst the group of disability activists at their lack of understanding and appreciation of the need to move towards systems and policies that allow people to live independently in their own homes and communities. “There didn’t seem to be much vision around the rights and preferences, contributions and potential of people with disabilities in a modern society,” he said. He said that, after over two full days of campaigning, the disability activists had become stronger in their resolve to make disability a key issue in the next election. He said that public support and media support had been overwhelmingly encouraging. The outdoor campaign will finish up after the press conference.